Relax in the comfort of the Lord's love when you listen to the delightful Christian music from His Loving Wings in West Des Moines, Iowa. 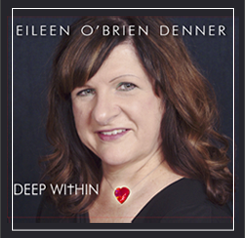 Performed by our owner and event planner, Eileen O'Brien-Denner, this beautiful Christian CD mixes old standards with modern classics, taking you to a prayerful place and helping you find healing, comfort, and peace. This rich and immersive listening experience, Deep Within, gives your soul much-needed rest. The emotional, heartfelt songs have often moved listeners to tears of joy and release. If you have recently lost a loved one or have been confronting a difficult issue in your life, listen to this CD to unlock the strength hidden in your soul and reconnect with the power of God's love. Receive the entire song collection for just $15.95. Invite Eileen to your next event and watch as she wows the crowd with her beautiful, soaring voice. Her live vocal performances are a wonderful addition to any event and bring a sense of fun and worship to fund-raisers, cocktail parties, and other venues. We encourage you to speak to our staff to find out how you can book Eileen and to learn more about her performance rates.